If you’ve been to the cinema this year, chances are you saw a film that contained special effects. Almost every modern film features some form of special effects (SFX), whether its make-up prosthetics or CGI graphics. No surprise then that the team behind THE HOLLYWOOD SPECIAL EFFECTS SHOW decided to bring the glitz, glamour and gore of Hollywood to the stage. THE HOLLYWOOD SPECIAL EFFECTS SHOW is an interactive and explosive family show that takes you behind the scenes of creating movie magic. The 110-minute show reveals the science and secrets of movie special effects, providing an interesting insight into some of the most spectacular scenes ever filmed in Hollywood. The fast-paced show is split into short 10-minute sections. 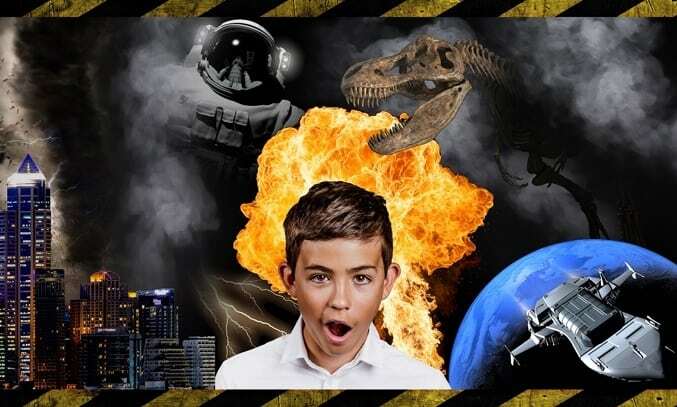 Stunt effects like fight sequences, fireball explosions and sound effects are demonstrated live on stage as a team of three professionals – Sonia, Richard and Duncan – attempt to break down the science behind them into bite-size snippets. The visual demonstrations are interesting, fun and entertaining although a couple of stunts fall flat including a gun shooting sequence in which the pyrotechnics failed to go off. A short but impressive sequence involving an animatronic dinosaur stands out as one of the highlights, along with a daft but entertaining sketch demonstrating the use of sound effects. While the idea behind THE HOLLYWOOD SPECIAL EFFECTS SHOW is certainly interesting, the pitch ultimately fails to match up to its intended audience. Billed as a family show for children aged 6 and over, the presenters deliver the content in a juvenile way but some sections are very adult in their content. For example, a section on horror films opens with a rather disturbing scene in which an axe-wielding murderer storms onto stage, scaring almost all of the younger children in the audience, as well as a few of the adults. The presenters then continue to talk about films and TV shows like Psycho (1960) , 28 Days Later (2002) and Game of Thrones which are intended for audiences aged 18+ and are therefore completely irrelevant to the younger children. That said, there are plenty of interesting movie facts and clips to keep the audience engaged and the show lives up to its promise of interaction, with four different members of the audience pulled up on stage throughout the show to assist with the stunts. The explosive finale with its elaborate pyrotechnic display and large air cannon also impresses, resulting in most of the audience leaving with a smile on their face. If the issues with the pitch and delivery are ironed out, THE HOLLYWOOD SPECIAL EFFECTS SHOW has the potential to be something really special.